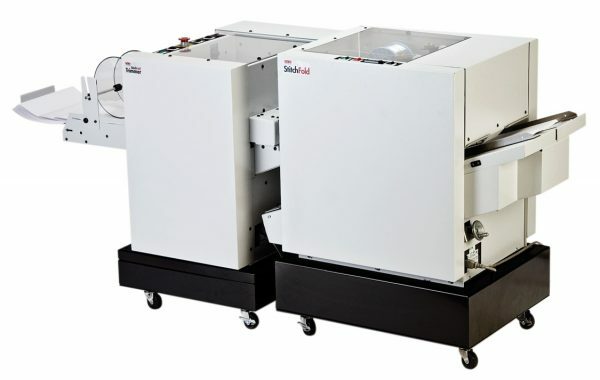 The patented ISP Stitchfold wire fed bookletmaker provides substantial savings over bookletmakers using pre-formed staples. It produces booklets up to 100 pages at speeds up to 2,300 books per hour. The machine jogs the loose sheets, stitches and folds up to 65,000 booklets before the need to change the wire spools. It runs in-line with a variety of collators including the optional 10 or 20 bin MBM model FC friction fed collator. Also available is a heavy duty face trimmer. Another option is an inline corner side stitcher.